There it is. I’m ready to say it. I’m a believer in the Bills. I believe that this is a good team. I believe it’s a team built for success. I believe it’s a playoff team. Yes, I said it. This is a playoff team. It’s not easy to do that. I’ve covered the NFL for a long time. I’ve covered the Bills for this 17 year playoff drought. Which means I’ve been there for the good starts, like the 5-2 opening in 2011 that then led to a seven game losing streak. So I understand why a lot of Bills fans aren’t there yet on their “believe” meter. I also understand it’s dangerous to make any proclamation after only seven games. But after what I saw Sunday in the Bills throttling of the Raiders, I’m convinced. Here’s why. 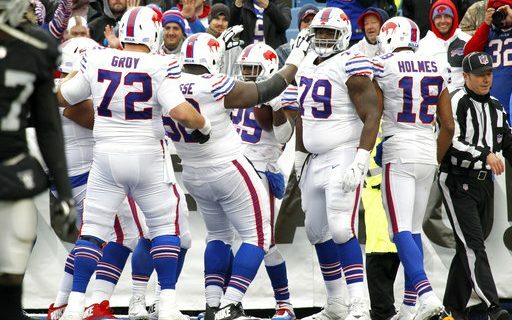 The Bills aren’t winning with gimmicks, tricks, smoke & mirrors or luck. They’re winning with good, solid, hard-nosed football. You can tell me that the +14 turnover margin is lucky. I’ll tell you that some of it is, but I’ll also tell you that you make your own luck. When your players understand how to rake out a wet ball against a West Coast team, that’s not luck. When a smart player like Micah Hyde is always in the right place to lead the NFL in interceptions, that’s not luck. No one will argue the Bills are the most talented team in the AFC. But I’ll tell you they’re playing harder than any team in the conference. A lesser team, playing together and giving maximum effort, will win a lot of games. Did the Raiders have more talent? Yes. Did that match the Bills effort? No. Sean McDermott and the coaching staff understand what their players can do. They understand that this is a hungry, mostly no-name team looking to make their mark. McDermott has played on that emotion, and he’s getting the best out of his 53. The Bills are playing the kind of football that is sustainable. Hard work, effort, good coaching and smarts will win a lot of games against similar teams. Left on the Bills schedule are the Jets, Saints, Chargers, Colts, Dolphins (twice). Similar teams in many ways, but none really better than Buffalo. If Team Together keeps this up, those could all be wins. That’s six games. So Buffalo could lose twice to the Patriots, once to the Chiefs, and even split with the Dolphins. That’s a 10-6 record.